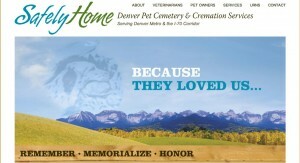 We recently redesigned the website for our client, Safely Home, The Denver Pet Cemetery & Cremation Services. It’s part of the new branding package designed to showcase Safely Home’s emphasis on compassionate care as well as the loving relationship between owners and their beloved pets. The hallowed grounds of Safely Home Denver Pet Cemetery & Cremation Services contain the memories of thousands of amazing pets, including the world famous coyote-German Shepard mix, “Sergeant Geronimo.” Geronimo was the paratrooping WWII mascot of the 507th Parachute Infantry.